and help out a cause VERY near and dear to my heart. Fearless painting, that which we dove into at Total Alignment, is truly about the process - not the product. There is a completely different energy that goes into creating a painting when it is being done to explore one's own self versus creating a painting to sell...and a completely different awareness that results. 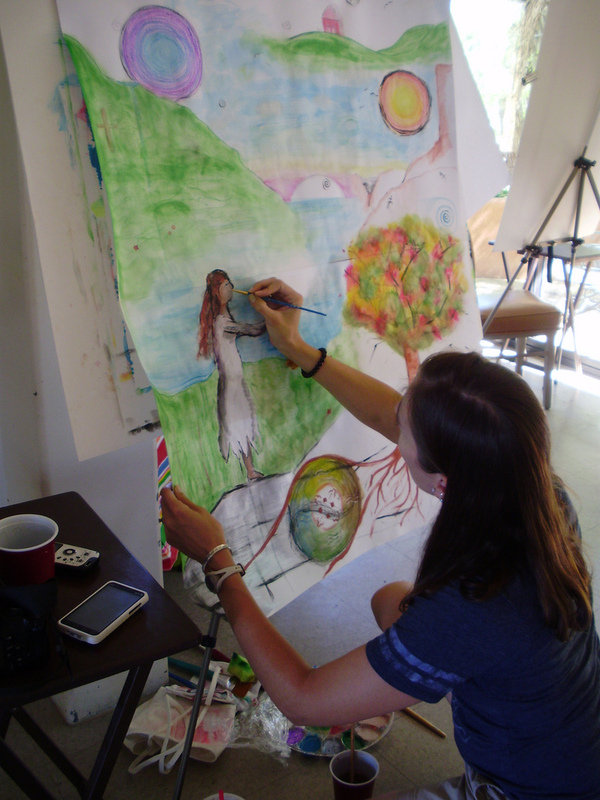 I created a few fearless works of art at the retreat - each with its own beauty. One, however, didn't get finished within the hours of the retreat. It rode home with me on the plane, still whispering to me the stories it wanted to tell. This particular expression was most definitely a process painting. It was an exploration of stories I needed to tell to myself, images and symbols that needed to get out of my thoughts and my body and onto the page. Yesterday, I danced my way outside and brought the painting to its current state of completion. It all arose because of a soul-touching poem, shared and read by the beautiful Christine at our retreat. The poem, To Begin With The Sweet Grass, by Mary Oliver, honestly brought me to tears. Connie shared the complete poem accompanied by pictures here. I strongly encourage you to take 2 minutes and read it. 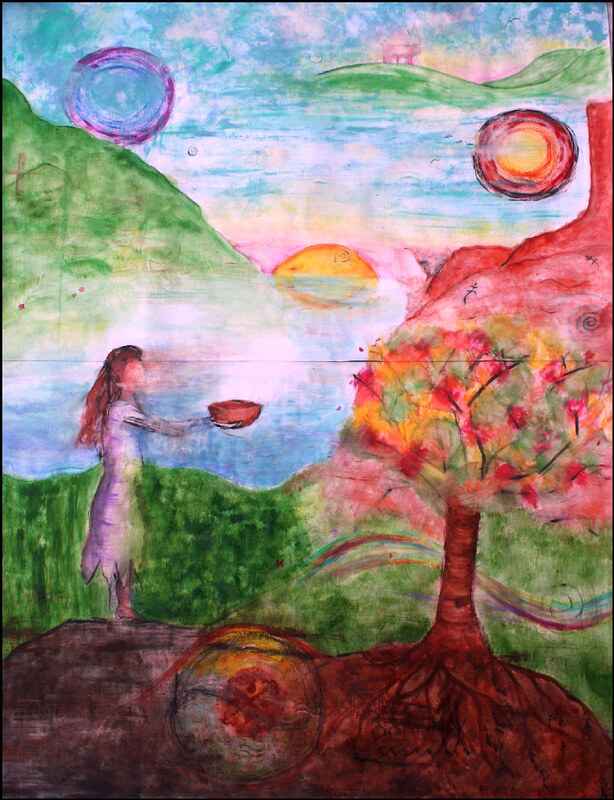 For simplicity's sake here, I share only those lines and stanzas that inspired this painting. I was reminded of connection - to the poetic word as it connects to the yearnings of my soul, to the temperature of color as it melts from my finger or the brush onto the paper. I was informed that I am in charge of defining and re-defining reality. In my art (as in life), I don't like having anything that looks too real or too cartoon-y. I'm not trying to recreate what I see or create a new reality...I'm expressing and allowing it to be simply what it is. I was reminded that I must first offer my bowl - full of SPACE - and trust that it will be filled with what I need to survive and thrive. How I look as I offer it - the shape of my body, the worth of my clothes or the cleanliness of my house - simply doesn't matter. Enough words. Back to the process.